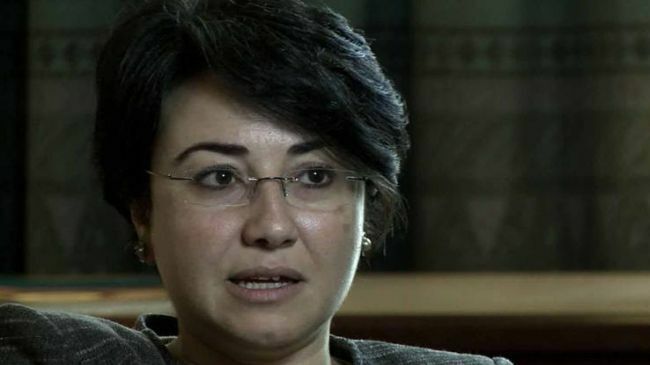 Israeli Knesset member Haneen Zoabi says Tel-Aviv will continue to usurp Palestinian lands as Israeli forces attack Palestinian demonstrators on the 37th anniversary of Land Day. “They take what we have, and try to get rid of us and then push us into a small piece of land. Colonialism? - even worse,” she added. The Arab member of Knesset went on to say that “Tel Aviv will continue to force out nearly 30,000 Palestinians from their villages in Naqab desert in a bid to usurp 200 acres of their lands." The Knesset member made the remarks hours after Israeli forces attacked Palestinians in the occupied West Bank and Gaza, injuring dozens of protesters. Clashes broke out in the village of Jayyus after Israeli troops fired teargas canisters at hundreds of Palestinians who wanted to plant trees in agricultural lands in commemoration of Land Day. Several people were injured in the attack. Similar scuffles erupted at Qalandiya checkpoint in the West Bank city of Ramallah, where Israeli forces fired tear gas and rubber bullets to disperse protesters. Several protesters were also wounded in the incident. March 30 is commemorated every year because of a deadly incident on that day in 1976 in which Israeli troops killed six Palestinians during a protest against the Israeli occupation of the Palestinian lands. Palestinian activists also marched on the Israeli apartheid barrier. A similar rally was held in the town of Sakhnin. During the 2012 Land Day protests one person was killed and more than two dozen others were wounded after Israeli forces opened fire on demonstrators in the northern Gaza Strip. On the same day in the West Bank, Israeli forces beat up a crowd of peaceful demonstrators in al-Quds (Jerusalem) and arrested a number of protesters. Israeli police also fired rubber bullets, and teargas, and used stun grenades to disperse the protesters. Haaretz newspaper revealed Israeli moves to seize 140,000 dunums of Palestinian land north of the Dead Sea and register it as a state land. According to the newspaper on Friday, the Israeli government intends to make these dunums of land under the authority of its army, while the Israeli civil administration rejected the objections filed by the owners of this land against this annexation. It said that these dunums of land are located in a politically sensitive area. 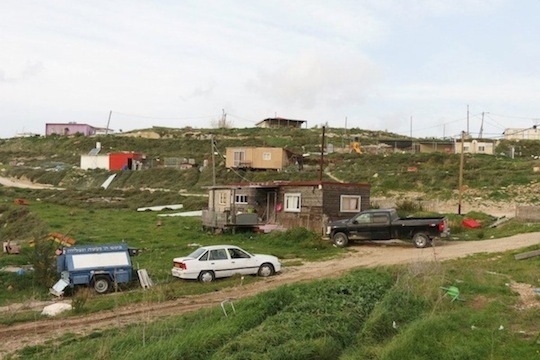 The Palestinian natives of villages, Za'tara, Sawahra, Deir Saleh and Tekoa, near this land had officially asked to register it as their property, but the civil administration also declined their request and declared it as a state land. 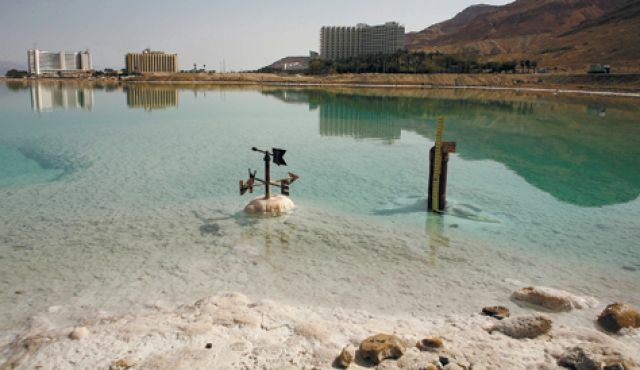 Some 35,000 acres of land previously under water are now exposed due to the shrinking sea line of the Dead Sea. Palestinians, who had hoped to claim it as their own for a tourism project, have lost out to the State of Israel. The shrinking sea line of the Dead Sea has opened up a Palestinian-Israeli legal battle over newly-exposed earth, and it looks as if the State of Israel has won. After two years of deliberations, some 140,000 dunams (35,000 acres) of land exposed by the receding of the northern Dead Sea can be registered as state land by the Civil Administration in Judea and Samaria. The decision comes after the preliminary registration committee rejected the claims of local Palestinian villages to the land. Once the registration is completed, the state can allocate the land to tourism projects, but will have to decide whether to allot it to Israelis or Palestinians. For years the Palestinians have been demanding land along the northern Dead Sea to erect a tourism project of their own, which would include a hotel, but their requests have been rejected. Over the past 20 years, the Dead Sea has been receding to a considerable degree, exposing stretches of land that were formerly underwater. Several years ago the legal advisers of the Civil Administration decided to launch a process of “preliminary registration” of the land before declaring it state land. The preliminary registration process in the West Bank is a procedure that ends with a declaration that the land belongs to someone and is registered as such in the Land Registry. The state and any individual with a claim to the land can bring evidence of ownership for the preliminary registration committee to consider. The panel is an independent body comprised of legal experts. As part of the procedure, the Israel Defense Forces checks with the Jordanian authorities as to whether there had ever been a Palestinian village there, as well as if anyone had purchased any rights to the land. In this case, neither is possible since the land had been underwater. But the adjacent villages of Zaatra, Sawahara, Dar Salah and Tekua filed claims, arguing that since they were owners of the old shorelines, since the shoreline has moved they are now entitled to ownership of the new shoreline. The committee deliberations ended last week with the army representatives rejecting the Palestinian claims, arguing that they could offer no proof they owned the land, and that it would be proper to declare it state land. Now the state can proceed with the process. The northern Dead Sea has three beaches that are operated by the Megilot Regional Council, which charges admission fees to bathers. The council expects to receive rights to the new land so that it can build tourism facilities closer to the new water line. As reported Thursday in Haaretz, since 1967, Palestinians have been allocated 0.7 percent of some 1.3 million dunams (325,000 acres) of state-owned land in the territories, compared to 38 percent allocated to the settlements. In documents released on Thursday to the High Court of Justice, the Israeli government has admitted what Palestinians have been saying for decades: that the Israeli government has taken over 99.3% of the West Bank, allocating most of the land to illegal Israeli ‘Jewish only’ settlements. The Israeli designation of 1.3 million acres of Palestinian land in the West Bank as ‘Israeli state land’ flies in the face of past Israeli claims that they are willing to negotiate in good faith with the Palestinians on the status of land in the West Bank. The documents were released as part of a lawsuit filed by Israeli human rights group Yesh Din that challenged the construction of the illegal settlement of Hayovel on stolen Palestinian land. The Israeli government argues that the settlement and the road leading to it are on ‘uncultivated land’, and have declared that such lands are subject to takeover by the Israeli government. After 1979, the Israeli government began widescale takeovers of Palestinian land using a law that passed in the Israeli Knesset authorizing the Israeli government to take over any Palestinian land that had not been cultivated in ten years. A study by Israeli researcher Dror Etkes found that the Israeli government has used land surveys that are meant to determine which land is cultivated and which is not as a political tool to take over nearly all of the land in the West Bank. 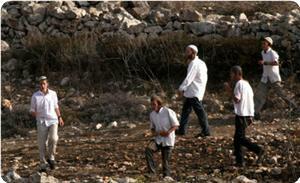 Jewish settlements in West Bank have been allocated 38 percent of 1.3 million dunams of Israeli state land. Over the past 33 years the Civil Administration has allocated less than one percent of state land in the West Bank to Palestinians, compared to 38 percent to settlers, according to the agency’s own documents submitted to the High Court of Justice. 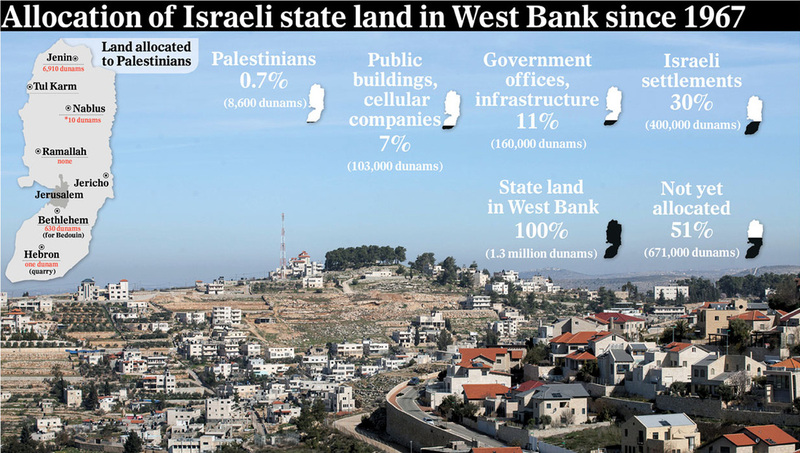 The West Bank includes 1.3 million dunams ‏(approximately 325,000 acres‏) of “state land,” most of which is allocated to Jewish settlements. The declared policy of the previous Netanyahu government was to remove Jewish construction from private Palestinian land in the West Bank and to approve all construction on state lands. According to the classification of the Civil Administration, a small amount of “state land” was registered with the Jordanian authorities until 1967. But most declared “state land” was declared as such after 1979. The need for such a declaration emerged in October 1979, when the High Court struck down as unconstitutional the state’s practice of seizing Palestinian land, ostensibly for “military needs” but in practice in order to establish Jewish settlements. It was after 1979 that the process of the wholesale declaration of territory as state land began. According to the law in the West Bank, any land with continuous agricultural cultivation for at least 10 years becomes the property of the farmer; land under cultivation cannot be seized by the state. Although the Civil Administration team charged with determining which lands are cultivated is supposed to base their conclusions on testimony and aerial photos, a senior official in the Civil Administration conceded recently in the Ofer Military Court that the decisions are political. The hearing at which the official was speaking was over the state lands declared with regard to the Hayovel outpost. The latter has been at the heart of a High Court case for over seven years. The state had decided to retroactively authorize Hayovel, but aerial photos clearly show a number of houses and cultivated land, and the road to Hayovel goes through private Palestinian land. The state therefore devised a method of declaring the area between cultivated spots, for example, between trees, as “uncultivated” and thus it could deem it state land. Palestinians claiming ownership of the land petitioned against the decision through the organization Yesh Din and attorney Michael Sfard. Three years ago the Association for Civil Rights in Israel and Bimkom − Planners for Planning Rights asked the Civil Administration, by dint of the Freedom of Information Law, for figures on the extent of state lands in the West Bank. The Civil Administration refused to provide the information and the organizations asked the court to intervene. The Civil Administration’s representatives told the court that there are 1.3 million dunams of state land in the West Bank and that it could not provide additional data. Jerusalem District Court Judge Yoram Noam did not accept the response and instructed the agency’s representatives to provide more information. The Civil Administration subsequently provided the court with the following details: 671,000 dunams of state land is still held by the state. Another 400,000 dunams were allocated to the World Zionist Organization. Most of the Jewish settlements, both residences and agricultural land, are on this land. Another 103,000 dunams of state land were allocated to mobile communications companies and to local governments, mainly for the construction of public buildings. Utilities such as the Mekorot water company, the Bezek communications company and the Israel Electric Corporation received 160,000 dunams, 12 percent of the total state land in the West Bank. 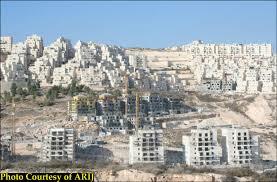 Palestinians have received a total of 8,600 dunams ‏(2,150 acres‏), or 0.7 percent of state land in the West Bank. The Civil Administration told the court that of this, 6,910 dunams were in the Jenin district, land allocations made a long time ago that are now in areas A and B ‏(under full Palestinian control or Palestinian civilian and Israeli military control, respectively‏). One dunam was allocated for a stone quarry in the Hebron district; 630 dunams in the Bethlehem district were allocated for Bedouin; 1,000 dunams were allocated in the Jericho district and 10 dunams were allocated in Tul Karm. Nir Shalev, a researcher for Bimkom, said: “Israel has claimed for years that the settlements are built only on state land, a claim that is repeatedly shown to be inaccurate. Because state land is essential for the expansion of settlements, a great deal of pressure is exerted to influence the decision of where such lands are declared. Haaretz checked and found that even when the state claims that certain lands are state lands, the process of determining usage beforehand is careless, and land declared as state land also includes private Palestinian land and cultivated land. One example of such carelessness regards the large settlement of Givat Ze’ev, northwest of Jerusalem. Next to the settlement is a home belonging to a Palestinian man, Saadat Sabri, who also cultivated a plot of land nearby. 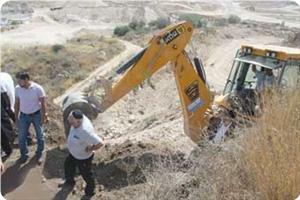 In 2006, when building began on the separation barrier, bulldozers destroyed his fields. Although aerial photos clearly showed the land was cultivated the state declared the land to be state land in 2010 and joined Sabri’s plot to Givat Ze’ev. Sabri petitioned the High Court against the move. Researcher Dror Etkes found that land important to the expansion of settlements was declared state lands, including territory near Susya, Tekoa, Ma’aleh Adumim, Kiryat Arba and other Jewish communities. In the center of Ma’aleh Adumim, for example, is land that aerial photos from the 1970s show as partially under cultivation. Yet in 2005 the entire area was declared state land and is now built on. The Civil Administration did not respond to numerous requests for comment. Israeli occupation forces (IOF) arrested on Wednesday five young men from Nablus in the northern occupied West Bank, and stormed the city of Jenin and searched citizens' houses. According to local media sources, a number of military jeeps stormed at dawn the village of Burqa west Nablus, where the soldiers searched a number of houses and arrested four citizens. The Israeli forces arrested also a 17-year-old boy, from the Balata refugee camp last night, while crossing Al-Hamra checkpoint in the Jordan Valley in Tubas Governorate. Meanwhile, Israeli forces raided the southern West Bank city of al-Khalil early on Wednesday morning and detained five Hamas leaders and MPs, local sources said. The detainees were identified as MP Muhammad Jamal Natsha, Mr. Abdul-Khaliq Hasan Natsha, Dr. Amjad Hamouri, Sheikh Muhammad Tahsin Shawar, and Jawad al-Jaabari. They were all taken to unknown destination. An Israeli military force broke into the home of the citizen Salama Salaymeh in the neighborhood of al-Buqa'a in eastern al-Khalil, and turned it into a military base. Salaymeh said that Israeli troops raided his three-storey home at dawn and forced him to gather his 15 family members and stay in the first floor. The soldiers stationed themselves on the third floor and turned into a military post. Al-Buqa'a area has been subjected to a fierce campaign that aims to evacuate its residents, in order to provide protection to the settlers who live in the nearby settlements of Kiryat Arba and Kharsina. Occupation authorities have been demolishing Palestinian houses in the area since 1982 in an attempt to seize it and incorporate it into the two settlements. The IOF have also stormed at dawn Wednesday, the city of Jenin and the two villages of Beit Qad and Jalqamus east of the city. No arrests have been reported. According to local sources, five military vehicles broke into the eastern neighborhood of the city of Jenin, where they erected a checkpoint and raided houses. 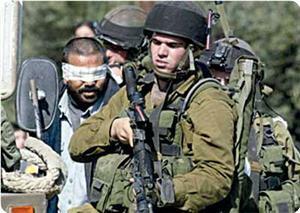 The occupation forces stormed the villages of Beit Qad and Jalqamus east of Jenin. The soldiers searched the greenhouses and olive groves and questioned a number of farmers. The occupation issued a decision to enlarge al-Jalama checkpoint north of Jenin, which represents the only passage from Jenin to the Palestinian 1948-occupied territories, and handed over citizens from the village of Jalama notices to confiscate their lands for the expansion of the checkpoint. Al-Jalama village council said that Saleh Abu Farha received a warrant reading that the administration of al-Jalama commercial checkpoint decided to possess three dunums of his land in order to enlarge the checkpoint and install a security gate at the main entrance. The village council pointed in a statement today to its concern about the occupation scheme to expand the al-Jalama checkpoint, set up on the citizens' lands, at the expense of other lands threatened with confiscation. It added that the occupation has confiscated almost 80% of al-Jalama village lands since 1948. 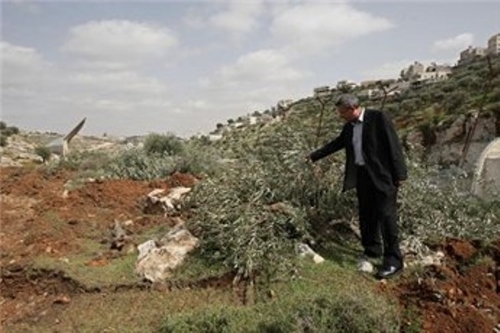 Israeli forces confiscated agricultural Palestinian-owned land in the village of al- Jalama, east of Jenin. Security sources told Palestinian official news agency WAFA that Israeli forces confiscated around one and a half dunums belonging to Mahmoud Abu Farha, adjacent to al-Jalama Israeli military camp, under the pretext of "security reasons". The outpost of Derekh Avot, sitting on stolen Palestinian land, will soon be whitewashed and its lands will magically turn into ‘state lands’ which will be delivered to the settlers. A letter from the Officer of the Legal Advisor of the Commander, Judea and Samaria Area – the name the IDF attached to the West Bank – arrived recently at Yesh Din’s offices. The letter said that soon, the Custodian of Government Property intends to announce the lands on which the outpost of Derekh Avot is located as Public Lands (commonly known as “state land”). It further said – feel free to snicker – that prior to making the decision, the Custodian will hold a hearing, in which our clients, the owners of the land, may make their claims to it. Derekh Avot, notes Peace Now (Hebrew), is one of 16 outposts built partly on stolen Palestinian land (this is a good place to give a shout out to Hagit Ofran, who excels at the Sisyphean and thankless job of documenting the creeping annexation of the West Bank). A report commissioned by the government in 2010, written by Malka Ophri, the chief of the Photo-Analysis Department in the Israeli Mapping Center, found that 60% of the lands controlled by the outpost are lands which were previously tilled by Palestinians, which makes them, according to the laws operative in the West Bank, private lands. Among the residents of the outpost you may note settler legend and convicted felon Ze’ev Hever (under his original name, Ze’ev Friedman, he was convicted of planting a bomb under the car of a Palestinian leader). The settlers used to quote Zvi Yehuda Kook, the rabbi of the movement, who said that settlers had no problems with “the individual Muhammad,” just with the Palestinians as a group, and hence they have no intention of stealing private Palestinian property. It was a lie then and it is a lie now. The whole process of declaring lands as “state lands” (although the more accurate name is “public lands”) proves this point. It derives from the fact that confiscation of lands in occupied territory is prohibited in international law, unless for strictly military purposes. After the High Court of Justice forbade the army from declaring settlements as “military bases” in the 1970s – the army and the settlers were thick as thieves even then – the government started using the new schtick of “public lands.” Making a manipulative use of Ottoman land law and the fact the British and the Jordanian authorities never finished registering the lands while ignoring the common law practice of villagers testifying to land boundaries, the government declared lands which went uncultivated for some years as “public lands”, thereby confiscating them from their owners. “Confiscation”, as used here, Is the bowdlerized term for robbery by people in authority. You’d think that “public lands” would serve the public, i.e. the Palestinian population, since Israel runs the West Bank based on the concept that it is held in wartime occupation. This concept is the basis for all of the military authority there. As noted, according to international law, confiscated lands can only serve for pressing military needs or the benefit of the residents. In practice, however, state lands serve almost without exception for building settlements. The case of Derekh Avot is particularly malicious. The outpost was built during the Second Intifada, when no one had the time or inclination to deal with fine points of law. When the Civil Administration was forced to examine the status of the lands, it tried – as exposed by Chaim Levinson (Hebrew) – to suppress the report. The reason was simple: the report showed that the land was stolen, plain and simple. In 2010, the government came up with a new trick: it told the High Court that it does not intend to evacuate the outpost – even though orders for its demolition were issued – because of the settlement freeze. The court accepted this position (Hebrew) while criticizing the government for, err, being economical with the truth. Just how relaxed the settlers have become with this system can be seen by the ad found by Peace Now (Hebrew). 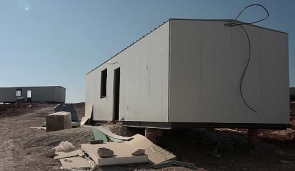 A caravan in Derekh Avot is offered for sale, along with a dunam of land. The ad makes it clear that there are no building permits – but building goes on nevertheless. So now these lands, stolen by force and by government fiat from their legal owners, will become with the scribble of a clerk’s pen, “state lands.” These, in turn, will be turned over to the settlers who already live there, which will retroactively whitewash the long illegality of Derekh Avot’s existence. Don’t steal, goes the old anarchist maxim; the government hates competition. In this case, the government is splitting the loot with its allies.